Are economics papers too long? 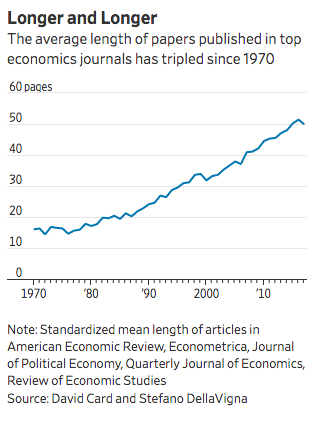 A recent Wall Street Journal article addresses the observation that academic papers in economics have increased in length over the years. Below is a graph that clearly shows this trend. In 1970 the average length of economics papers in “top journals” was about 16 pages. In 2017, the average length is over 50. That is a big increase! But is this a “bad thing” and, as the title of the article suggests, is there “demand for brevity”? To answer these questions, it is helpful to think about what also has changed in the last 40 years of academic economic research. A huge change is the way economic research is performed. With the increase in computing power and the decrease in cost of collecting real-world data, the economics profession has become increasingly empirical. This means that more and more papers are using real world data to test theories. This drives up the length of papers two reasons. First, papers that may have only included a theoretical contribution now typically have some sort of empirical test of the theory. The theoretical contribution of the paper is not any shorter, the paper now just also has an empirical section. Second, empirical work is tricky. It requires a multitude of robustness tests to make a convincing argument. This takes up more space. I certainly can’t speak for all economists, but I know I am not alone in feeling that the trend toward more empirical work in economics is, on net, a positive thing. Therefore, any discussion about the length of economics papers needs to consider why papers are getting longer and weigh in these developments as well. Another change is in the way economics papers — and in particular applied microeconomic papers — are intended to be read. That is, they are not written with the intention of the reader reading all the way through. It took me a while to figure this out. Reading the introduction, looking at the tables and figures, and reading the conclusion should be a sufficient way to understand an applied microeconomics paper. The rest of the paper is there for reference and added context if needed. Say you are skeptical about how the data are collected or used, or you have a question about the identification strategy, then it is worthwhile to read into those specific sections of the paper. Now, Miles Kimball makes the point that, “If most important papers are so long that almost no one really reads them, the conversation among economists becomes impoverished.” I emphatically agree. However, if more economics papers are written in the standard format of applied microeconomics papers, then longer does not necessarily mean less digestible, harder to read, or less conversation-inducing. The title of the WSJ article suggests that “economists can’t write economically”. I don’t think that is necessarily always true. Read the introduction and look over the tables and figures of a good applied microeconomics paper and I bet you’ll learn more about the world in less time than it takes to read a 16 page economics paper from the 1970s. Is there an Identification-Importance Trade-off? ← Refugees and Crime: What is the Evidence? Good points Jeff. I think we should strive as economists to maintain self-contained papers that don’t take all day to read (that is, continue to target 15-20 pages on average). Since most articles are published and consumed online these days, the remaining 40 or so pages should be shunted to appendices. This way, authors can highlight the bare minimum in the abstract, give a self-contained overview of the research in the “article”, and share all of the other robustness checks, proofs, etc. in separate appendices. We should strive to make our writing as user-friendly as possible, and expecting potential readers to have to spend a year learning where to look for the relevant info is not a user-friendly approach. Take the Nature journals or PNAS, for example, where articles are frequently less than 10 pages but supported with 60+ pages of appendices and supporting information. Hope to see you in DC in a couple weeks!